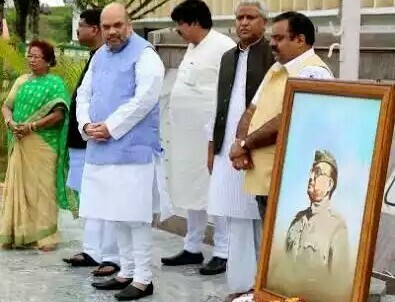 On tJanuary 23, BJP-RSS organized various programmes to honour Netaji Subhash Chandra Bose. In one of these programs, a clash took place leading to a curfew in Kendrapada, Orissa. In different meeting organized by BJP-RSS, an attempt was made to draw parallel between Bose and Savarkar, Bose and RSS. Propaganda is on to show that it was on Savarkar’s suggestion that Bose undertook to tie up with axis powers (Germany and Japan). Parallels are being drawn between RSS and INA (Azad Hind Fauj). Now all attempts are on to show that Bose’s nationalism was close to that of Savarkar-RSS. The RSS combine is trying to praise Netaji as the one who gave legitimacy to struggle for Independence against British. When did this combine realize the contributions of this great freedom fighter? Or for that matter the question comes did RSS combine ever want to struggle against British rule? It is last few years that these attempts to identify with national icons are going on. While in case of Sardar Patel the propaganda is that, had he been the first Prime Minster of India, we would not have had Kashmir problem, we would has progressed more. The truth in this matter is that Patel and Nehru were two solid pillars of Indian Cabinet who gave foundations to Indian republic. The differences among them were of minor nature and Patel was the most trusted Cabinet colleague of Nehru. As far as Netaji is concerned, we know that he is one of the major freedom fighters of India. He was part of the Indian National Congress most of his life and was its President of Tripura session in 1939. Within Congress he was part of the socialist group. He and Nehru had matching ideas on issues of socialism, secularism among others. He did fallout from Congress on the issue of method of getting freedom. While Gandhi-led Congress wanted to adopt the path of non violence, Netaji did not see eye to eye on this issue. For getting freedom for India, Congress launched ‘Quit India’ movement to build anti-British pressure, and this gave boost to the freedom struggle. During the Second World War, Netaji’s approach was to launch armed military action against the British by collaborating with axis powers (Japan and Germany), that’s how he set up INA. He also formed free India’s provisional government in Singapore on October 21, 1943. He has been a charismatic leader who was thoroughly anti-British. Undoubtedly Congress was firm in the path of non-violence. It launched Quit India movement which was led by Mahatma Gandhi. Bose did develop some differences on the matter of fighting against the British. He resorted to tying up with fascist Germany and its ally Japan. What were RSS and Hindu nationalists doing at this point of time? Hindutva ideologue Savarkar, the progenitor of Hindutva and Hindu nation ideology, propagated at that time that Hindu nationalists should help British in their war efforts against Japan and Germany. RSS sarsanghchalak MS Golwalkar instructed all its branches not to do anything which will annoy British and kept aloof from the anti British struggles. So while Congress was putting pressure on British through Quit India movement, Netaji was fighting British through INA, Savarkar was proactively helping the British by helping them in recruitment for armed forces. In a way, RSS did nothing which went against the British rule. So here, with a forked tongue, Hindu nationalists on one hand were supporting the British in their war efforts (Savarkar) or keeping aloof (Golwalkar-RSS), on the other now they are eulogizing Netaji for his anti-British INA! While Netaji was socialist, close to the ideas held by Nehru, Golwalkar went on to write that communists are internal threat to the Hindu nation. While BJP at the time of its formation used the word Gandhian socialism, it was a mere electoral jumla (gimmick). The ideology and actions of Netaji and Hindu nationalists-RSS were poles apart. So why are they projecting him today? Why are they trying show similarities which are not there? Essentially, as RSS did not participate in freedom movement, it does not have any national icon. RSS’ Atal Bihari Vajpayee at that time was a young college student who during Quit India movement was jailed by mistake; he apologized and got himself released. Savarkar, since he was anti-British before being imprisoned in Andman jail,/has been glorified as the brave warrior by prefixing Veer (brave) to his name. He also apologized to the British and got released from the jail. Mostly the communal nationalists, Muslim League-Hindu Mahasabha-RSS, never took anti-British stance. This should be the defining point for Indian nationalism. Congress and Bose were anti-British to the core, so their nationalism in a way has similar wave length despite some differences. When INA of Bose was being tried by British for their anti-war actions against the British, it was the likes of Nehru who defended the INA; none from the Hindu nationalist camp came forward to defend Bose and his colleagues during the trial by British. It is only for electoral reasons that now RSS-BJP need to identify with the likes of Patel and Bose. They are actively trying to dig up some points here and there to get a ride on the back of legends like Patel and Bose. So far Sardar Patel has been projected and now it’s Netaji’s turn! Their central opposition is to Indian nationalism. They vilify Nehru, who stood rock solid in defense of secularism and democracy. Since RSS wants to oppose the Nehru legacy and Congress on electoral ground, it keeps propping up icons like these. While these icons had some differences with Nehru, they essentially were on similar wave length as far as secular democratic values are concerned. These projections of Patel and Netaji are mere electoral ploys to garner more power!